Yes, I'm very much into these fall/winter "bakes" as you've probably noticed. It's mainly because I love how warm and comforting they are, but also because I get to use my nice Emile Henry ceramic-ware. Call me crazy but any time I get to take out a beautiful dish with a nice golden crust and bubbly hot cheese, it makes me happy. Preheat oven to 375 degrees. Lightly oil a square 8" x 8" casserole dish. To make the pesto, place the basil, 1 1/2 cloves garlic, salt and pepper (a pinch of each) into a food processor and pulse. Gradually add about 2 tbs of olive oil or more, depending on the consistency that you prefer. Pulse a few more times until incorporated and then take out of the food processor. Add 1 tbs of Parmesan cheese and mix with a spoon. In the meantime make the gnocchi according to the directions on the box. While the gnocchi is cooking, get the turkey ready. In a medium skillet on medium heat, add about 1 tbs of olive oil and then toss in 1 tbs of chopped garlic. Make sure to watch the garlic closely, as it has a tendency to burn quickly. Add the turkey and separate with a wooden spoon. Add salt, pepper, and dried thyme. Cook for about five minutes or until well done - taste to make sure that it's cooked through. Take the gnocchi out of the boiling water with a slotted spoon and place directly into the skillet with the turkey. 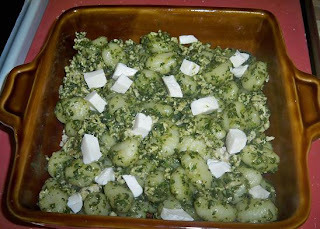 Add the pesto to the hot gnocchi and mix everything together until well incorporated. 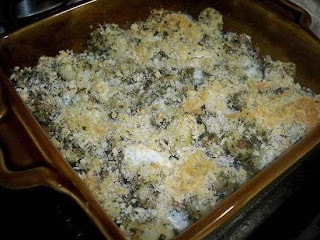 Place the mixture into the prepared casserole dish and top with cubes of fresh mozzarella cheese. Now prepare the breadcrumbs by tossing the panko with 1 tbs of Parmesan cheese. Add salt, pepper and a touch of olive oil and mix together with your hands. Sprinkle on top of the gnocchi mixture and bake in oven for about 30 minutes or until the top is golden brown and bubbly. Enjoy this meal with a big glass of your favorite beer. Foodista this looks amaaaazing!! Can't wait to try it--thank you for the innovative idea! just made the gnocchi bake and it was a homerun! thanks for the great recipe. Awesome - so glad to hear that gstar.